Capital Flight's 3rd Annual Customer Appreciation and Oshkosh AirVenture Kick-Off Party! 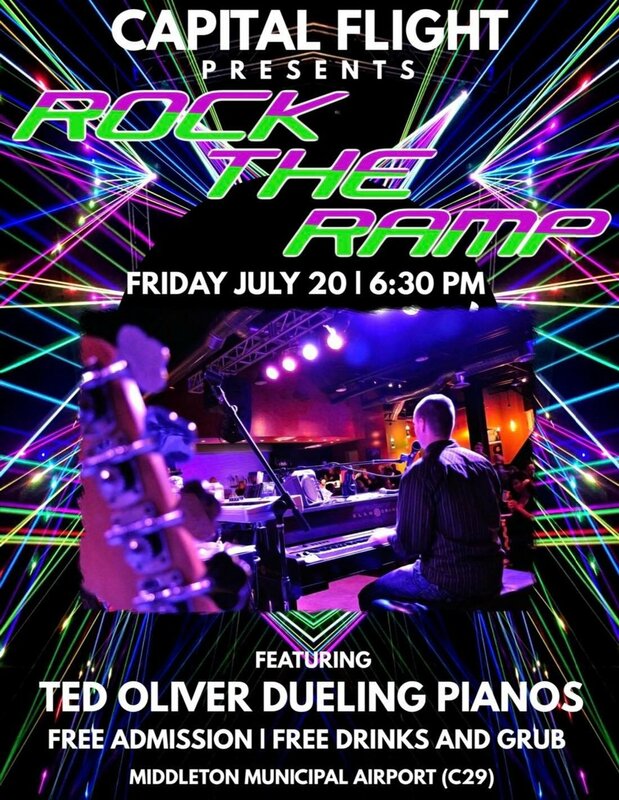 Join us Friday July 20th, 2018 (6:30p - ?) at the Middleton Airport (C29) for fun, food, entertainment and friends. Please bring your family and friends, kids welcome!! We are strong believers in aviation experiences that enrich our lives and further integrate aviation into our lifestyle. So, please join us for the EAA Hops and Props 2018. EAA’s 14th annual premier beer-tasting event is back and bigger than ever. Tickets include unlimited samples of over 85 of the best brews in the world, access to delicious food stations, live music entertainment and a commemorative tasting glass, all held in the amazing EAA museum. 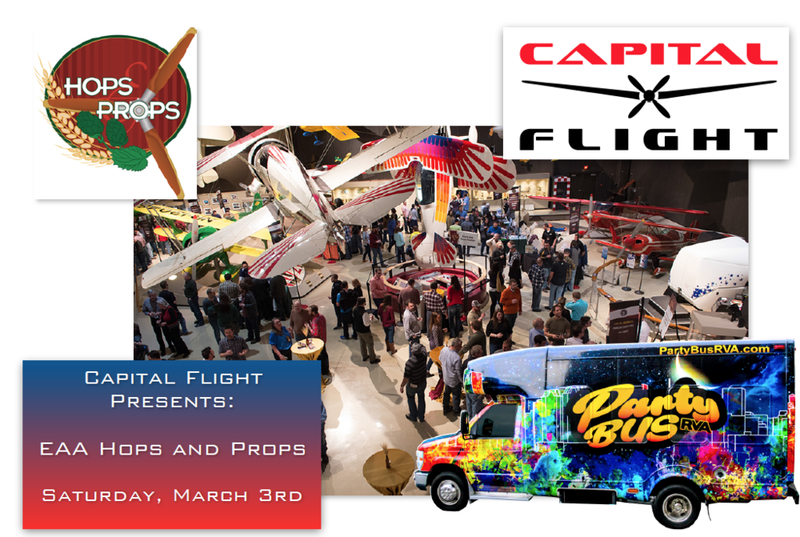 Attendees will arrive to Capital Flight’s hangar (C29) at 5:15 pm on Saturday, March 3rd for a prompt 5:30 departure via chartered party bus to Oshkosh. We will have a cooler and snacks for the ride up. We will then arrive to the museum at approximately 7:00 pm, and the bus will then return post event and arrive back to Middleton around midnight. The event ticket and bus is $125 per person. Only 22 spots are available, so reserve yours today, as they will surely sell out. If you have any questions or comments, please do not hesitate to call or e-mail. Join us Saturday September 23rd at the Middleton airport (C29) for a fun filled competition of pilot & culinary prowess. Landing competition will be a 3 attempt, keep your best score style. All Aircraft types and skill levels are encouraged to participate in this fun event. Grass and paved runways. Prizes awarded for 1st, 2nd and 3rd place. 1st and runner prizes for the Chili Cook Off will be awarded. Pilot Briefing and sign up at the Capital Flight hangar located on the south east side of the field starting at 2 pm. Bring a chair and watch the action! Contact Matt at 608-332-6110 for questions. Everything we love. Join us July 21st (6:30p - ?) at Middleton Airport for fun and food and friends. We are strong believers in aviation experiences that enrich our lives and further integrate aviation into our lifestyle. So, please join us for the Milwaukee Air and Water Show featuring the U.S. Navy Blue Angels, all set on the beautiful Milwaukee lake front. Attendees will arrive to Capital Flight’s hangar (C29) at 7:30 am on Saturday July 15th for a prompt 8:00 am departure via chartered coach bus to Milwaukee. We will have coffee and donuts waiting at the hangar. We will arrive to the event approximately 1 hour prior to show time, allowing guests time to view any displays and get settled into our reserved show center VIP area with spectacular views immediately along the flight line. We will have private bathrooms, waitstaff, and outdoor theater-style seating, all with the best views of the show. The bus will then return post show around 4:30 pm. Cost for the show ticket and bus is $85 per person for adults, $40 for children. (Children 2 and under are free with adult ticket when not occupying their own seat on the bus). We will provide coolers of beer/water and snacks for the bus. However, feel free to bring your own items for the ride should you desire. Only 55 spots are available, so reserve yours today, as they will surely sell out. Clear your calendar - It's going down! You're invited to take part on the ground floor of something awesome. Come one, come all, bring a guest, and hang loose. This is going to be epic! RSVP to make sure your name’s on the list. Get there before the swag runs out. We cannot wait to welcome you! Make yourself welcome and comfortable. Grab a drink and a bite. Aviation is all about being social. Grab a friend and check out the new G6 Cirrus Aircraft. We are completely grateful for your support and enjoying the evening with us. We can't wait to get started with you! See you at the hangar again soon. It's getting incredibly exciting this summer at Capital Flight. You'll finally be able to start learning to fly the way you have always wanted. You'll be able to learn real-world flying and experience what aviation is really like in a new G6 SR20. Structure your flight training around things that are important to you.